Sometimes things come easy and sometimes things come hard. The house came easy. We found it in 6 days, put an offer in a week later and 3 months later we were moving right in. Whoa, who would have know that these puppies would be so hard to find. I can finally say that the hunt is over. If you listen really hard, you can probably hear me sighing in relief. 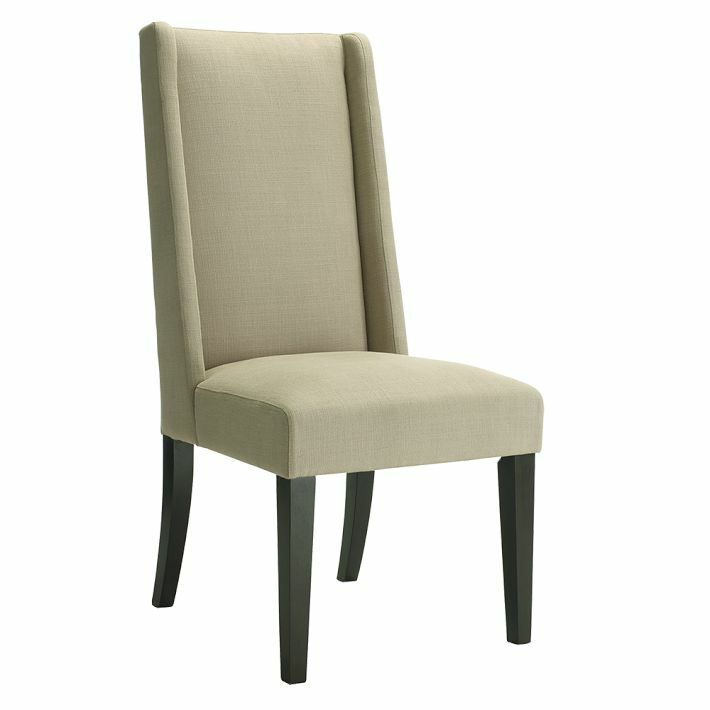 I love shopping, but I never want to shop for dining chairs EVER again. Actually, I think that was the point of this shopping saga. The reason we couldn't find anything was that we wanted to keep them for a good long time, so we didn't want to rush into a decision and buy something we didn't love. Before I unveil our final choice, lets go down memory lane with all of our considerations. At first we were in love with fabric chairs. Chris loved the West Elm chairs. I was pretty against them for a few reasons. First, they are creamy/grey and non-reuphosterable (totally a word) and they are huge! They felt way too big for the space and I was not very pleased with the price tag either- $280 per chair. I knew I would accidentally spill on them and then we both would be really pissed that I ruined a $300 chair. I liked the World Market chairs since they were much more affordable ($125), I liked the tufted seats and they were smaller in size. The only problem was that when you sat in them, the back had a lot of give, and they felt like they may fall apart. Not a good thing. After these 2 chairs, we realized that fabric chairs were not for us. We loved how they looked, but they just don't work in our lifestyle. I'm a spiller. A really bad spiller. Spilling and non-washable fabric chairs just don't mix. So we moved onto wood chairs. 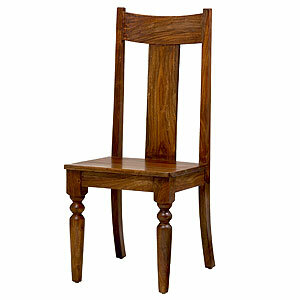 Wipeable, cleanable, non-stainable wood chairs. Now we were on a hunt. We went to 7 stores in one night. It was exhausting. And they were all wrong. What we realized is that furniture stores have chairs that are much too modern. Our house is 1918. We want to stick with furniture that fits the house. So we decided to go to an antique store. It seemed like a brilliant idea. We were in the antique store for all of 4 minutes when Chris declared that everything in the store was "too old" and looked like a grandma's house. So we left. So much for antique stores. We decided that we needed to go back to the beginning- where it all started. We went back to the store where we got our table and looked for chairs there- David Smith and Co. 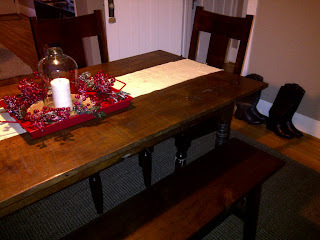 Although they didn't have any that we liked back when we bought the table, we thought it was worth a shot to try again. It was a good try, but they didn't have any good chairs this time either. What they did have was a bench that we both agreed on, so we brought it home. At least it was a first step. One bench down, 4 chairs to go. So we tried one last ditch effort. Go back to West Elm and World Market and look for wood chairs instead of fabric ones. That is when we finally found THE chairs. We hit the World Market in Bellevue- which Chris swears has a better selection than the Seattle store. We found a chair that we both agreed on. 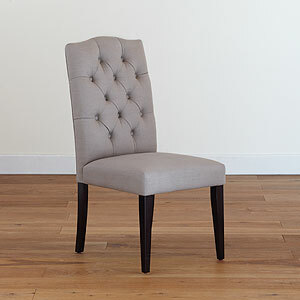 The World Market Sourav chair was the perfect fit. 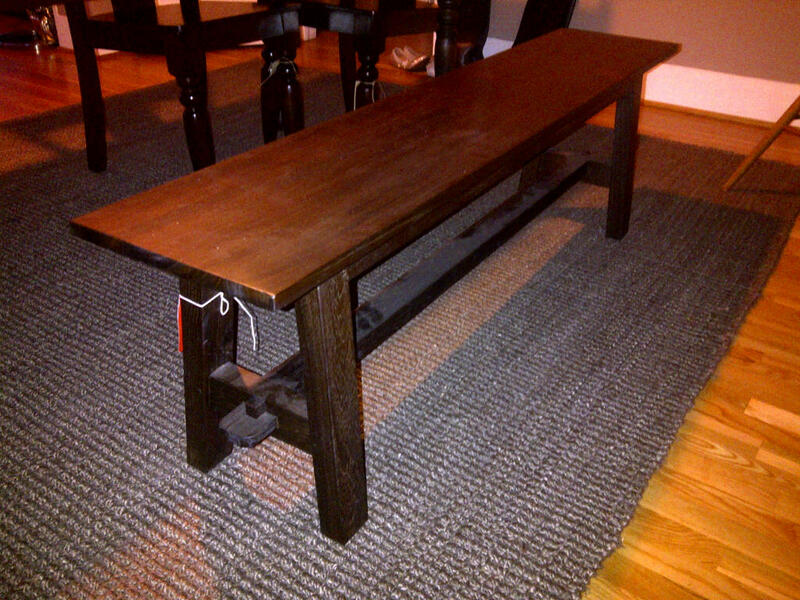 It was very sturdy, solid wood, the right color and price ($125- minus 15% off). We loved that it had detailed legs just like our table, but it wasn't too ornate. The high back was very important to Chris, and the comfort of the seat and back was important to me. We ended up buying 5 chairs- 4 for the table, and one extra to add in when we need to seat 8. I only got Chris to agree to the 5th chair by telling him I would use it at as my sewing room chair. The shopping nightmare is over. Just in time to have my family over for a little pre-Christmas dinner and game night. We can all sit down in matching chairs and eat together. Success! !